The idea of having a truffière with oaks available for adoption began to germinate in June 2001 when my daughter, Hannah, gave me a vine in a Sussex vineyard as a Fathers’ Day present. For years I had thought of moving to France and in February 2002 I came here for a week of house hunting. One possible, but far too large a property, stood out and it had the enormous advantage of being surrounded by farmland, a bit of which could be for sale. I returned at the end of April to look at the house again and signed contracts to buy both it and up to two hectares of farmland. I moved in four months later and one of my first tasks was to take soil samples and send them off to a specialist laboratory for analysis. Several weeks later the report arrived and the news was fantastic. 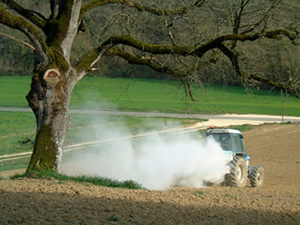 The land was highly suitable for truffle production – all that was needed was lots of manure to lighten the texture plus some potassium and phosphorous, and conditions would be perfect. Sixty tons of manure is not an easy thing to find but my neighbour raises chickens and he had lots of well-rotted stuff available. 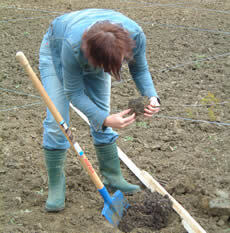 The land was manured, ploughed and harrowed and left over winter for the frosts to break up the fairly heavy clay. In spring the phosphorous and potassium were spread and, because the chicken manure was pretty acidic, I added enough lime to raise the pH by around 0.5. Next the whole area was enclosed with wire mesh supported by acacia fence posts to keep out deer, wild boar, other animal life and, ultimately, truffle poachers. Fortunately there are not many truffières in Le Gers and, I hope, fewer potential plunderers. Following another harrowing the entire area was divided into plots of 20 square metres with several kilometres of plastic string and planting began. I had ordered 100 trees (90 one year olds and 10 three year olds) from an old-established company in Grignan, a small town about an hour North of Avignon. The family had been growing truffles for some six generations and the grandfather of the current management team had been producing ‘treated’ truffle oaks several decades before INRA, the French agricultural research body, made public their own research efforts. The first trees were planted in very early April 2003 and immediately thereafter the watering system was installed. Meanwhile, following articles in The Financial Times, The Times and The Week, adoptions had begun to flood in. So a second batch of 100 trees was ordered. After administrative foul-ups and ten days in transit they finally arrived on 22nd May, looking as if the boxes had been kicked all the way from Grignan – far, far too late in the season to plant; but we did! And their arrival signalled the start of the canicule – the hottest and driest three months ever to hit France, with hardly a drop of rain and temperatures exceeding 40ºC for days on end. It was only thanks to the new watering system that any of them survived at all. Two years later it was evident that the one year old trees were rapidly catching up their older brethren and so a further 200 youngsters were ordered and planted in April 2005 to accommodate the growing number of adoptions. And demand continued to accelerate. 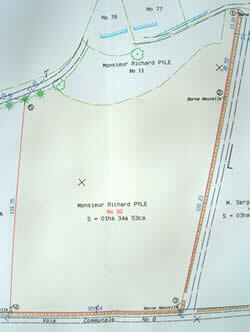 The natural solution was to buy the remaining piece of the field in front of Le Gardian, increasing the truffière from one hectare to almost three. 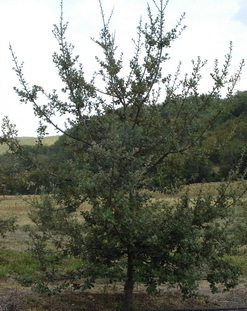 A further 450 trees were planted in perfect conditions in November 2006, this time bought from Robin Pépinières, one of two nurseries producing truffle oak seedlings under licence from INRA. They were beautiful little trees, of very even quality, and all individually numbered. They have settled in superbly helped by the atrocious, wet summer of 2007 which gave them the best possible start. These trees filled up the original truffière with some 270 spilling over into the newly purchased area. A further 400 trees were bought in November 2008. The weather, however, was diabolical and they sat around waiting to be planted until April 2009. Conditions were still far from perfect but they finally went in to be greeted very shortly after by a spell of beautiful rain followed by a warm summer. They have settled in remarkably well and are looking very good. There is still space in the truffière for 150 or so further trees but these will not be planted until 2011 at the earliest. And then? 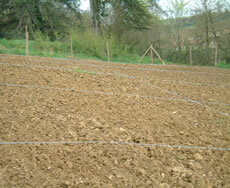 Le Gers covers 6,257 square kilometres, enough room, by my calculation, to grow 250 million truffle trees. Though, I guess, I’d have to leave some roads - and planning permission to demolish Auch Cathedral could be tough to get. The truffière will be managed according to the latest principles. A watering system has been installed to help the young trees establish but it is important not to over-cosset them as the roots must be encouraged to spread out in search of water to maximise the potential truffle-producing area. 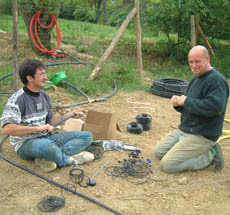 Later the emphasis on irrigation will turn towards the needs of the truffles rather than that of the trees. Rainfall will be monitored closely. The most critical growth period runs from mid July to mid August and any shortfall in rainfall during that time will be made up with irrigation. Weed growth during the first few years will be suppressed by hand-weeding, harrowing and sprays to ensure the trees get off to the best possible start – after that a little grass will be permitted in order that the brûlés, the patches of dead vegetation caused by the developing truffle, can be clearly seen. Trees will be regularly pruned, even in their first year, to ensure that effort goes into building a broad root system rather than a large canopy. A schematic of the 482 Oaks grown on the original plot. Google have recently updated their aerial photographs of our region. Below is their view of Le Gardian. The house is in the centre at the top. The original truffière can be seen on the right and in the centre the eleven columns of trees planted in November 2006 are clearly visible. Since the photograph was taken a further four hundred trees have been planted to their left, leaving space for some two hundred more. Finally the $64,000 question. When will the first truffles appear? How many? Some say as early as year three. Dr Khanaqa, a leading truffle expert, suggests between 150g and 450g per tree in year four, after which it should build up over the next twenty five to thirty years. I prefer to be a litle more conservative and go with the majority view that harvesting should begin between five and nine years from planting. But truffles are unpredictable. One tree may produce a bumper crop while its neighbour does little or nothing. It’s this area of uncertainty that makes the whole concept intriguing.